Did you know that Jersey City is located only 1 mile from lower Manhattan and is easily accessible by ferry, PATH, bus, train or car? Or that the Statue of Liberty is right at our doorstep! It’s only 2,000 feet (610 m) from Jersey City & over two miles (3 km) from NYC with no lines on the Jersey City side. Best of all, is the money you will save by staying here in Jersey City, New Jersey! 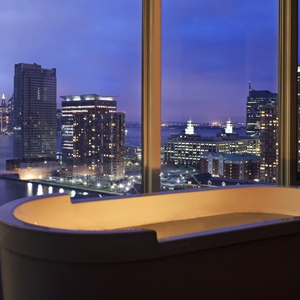 Jersey City hotels are less expensive than in NYC with phenomenal views of the Big Apple! For more information visit us at www.jcmakeityours.com! 1. First up, the Statue of Liberty, Ellis Island and the Central Railroad Terminal. You board the ferry for the Statue just outside the historic Central Railroad Terminal in Liberty State Park, where nearly two-thirds of the twelve million immigrants who entered this country through Ellis Island departed for their new homes. Queue up…no way! There are NO lines from the Jersey City side. 2. Calling all speed demons! Take your need for speed to the track at RPM Raceway. This brand new 80,000 square foot indoor karting facility featuring the fastest electric cars in the US, and tracks developed by NASCAR racers. Each race consists of 15 laps around the circuitous course with hairpin turns. It&apos;s you against the clock. 3. Explore the Liberty Science Center where learning’s fun, and catch a movie at the Nation’s largest IMAX Theater. Experience the hundreds of things to do, see and learn at Liberty Science Center. Everywhere you look, you&apos;ll find highly interactive, high-tech, hands-on learning opportunities designed to appeal to every age. 4. There is always a nice breeze in Liberty State Park, perfect for flying a kite. With astonishing views of NYC spend the day enjoying the waters by fishing or crabbing, boating, bicycling or kayaking. 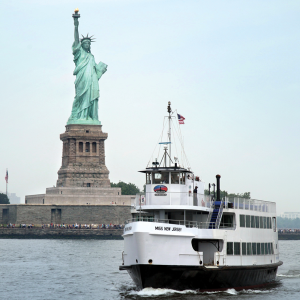 Hop on a ferry, year round, to visit the Statue of Liberty and Ellis Island, or stroll along Liberty Walk, take a specialty cruise or harbor tour, or stop by and participate in one of the Natural or Historical Interpretive programs at the Interpretive Center designed by famed architect Michael Graves. Institute! There are a myriad of wonderful and affordable cooking classes all offered in instructional kitchen labs with wireless technology, incorporating the latest designs in cooking equipment. 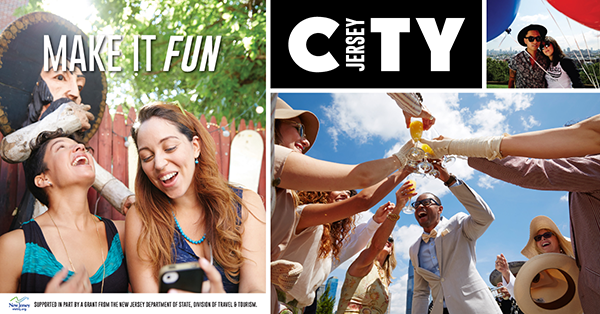 6.Jersey City is a true American melting pot, with over 90 different nationalities represented. Explore the richness of Little India with its vibrant colors and exotic flavors, in the heart of Journal Square. 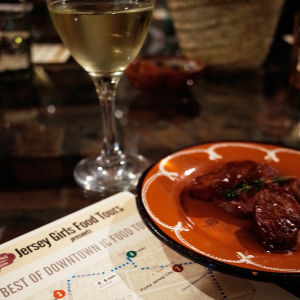 Or take a culinary tour with Jersey Girls Food Tours for a unique and personalized dining experience that is sure to please! 7. An ode to a bygone era, is the historic Landmark Loews Theatre, in Journal Square. This 3100 seat movie palace was built back in 1929, gilded, gorgeous with marble columns, bronze railings, rich tapestries; it’s one of the only theaters still showing movies on the big screen. Catch a classic film or experience the magic of a silent movie ringing to life with accompaniment from the Morton Wonder Organ. 8. Jersey City offers more value for your dollar with tax free shopping on clothing & shoes and only 3.5% tax at participating locations in our Urban Enterprise Zones. You’ll find great indie shops, luxury brands, boutiques and big brand stores. Our world-class restaurants are also less expensive and have offerings to please every budget. Enjoy waterfront dining with phenomenal NYC views or amazingly cheap and delicious ethnic meals. 9. We are steeped in history, Bergen Square’s Apple Tree House, was deeded back in 1658. Harsimus Cemetery was the site of many Revolutionary War battles. Take a walking Tour and find elegant residential neighborhoods, splendid architectural relics of the Gilded and Industrial Ages, mansions, brick houses, mews, tenements, and warehouses that have been well preserved. 10. Take a Sunset Cruise along the Hudson River an unbelievably romantic experience offering spectacular views of Manhattan and the Statue of Liberty.